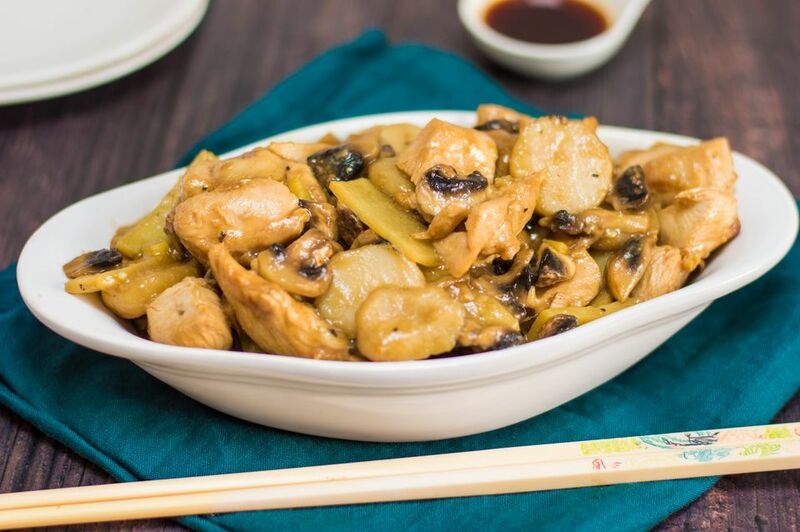 A popular restaurant dish, this recipe for moo goo gai pan means "fresh mushrooms with sliced chicken" in Cantonese. The original dish, known as mah gu gai pin, was adapted for Western tastes. Traditionally made with whole button mushrooms, other types of mushrooms can be substituted and, while some versions include bamboo shoots, water chestnuts, and snow peas, others include broccoli and other vegetables. Likewise, some versions are made with oyster sauce, while others contain hoisin sauce. Note: while there are multiple steps to this recipe, this Moo Goo Gai Pan dish is broken down into workable categories to help you better plan for stir-frying. In a large bowl, whisk together the soy sauce, rice wine or dry sherry, sesame oil, and 1 tablespoon cornstarch until smooth. Add the chicken strips or chunks, making sure to coat all sides, and marinate the chicken for 15 minutes at room temperature. While the chicken is marinating, prepare the vegetables. Wipe the mushrooms clean with a damp cloth and cut into thin slices. Drain and rinse the canned bamboo shoots and water chestnuts to remove any "tinny" taste. Slice and chop the ginger. Peel and mince the garlic clove. In a small bowl, whisk together chicken stock, oyster sauce, sugar, and 1 tablespoon cornstarch until smooth and set aside. Heat a wok and then add 2 tablespoons oil. Add the chicken and stir-fry until it changes color and is nearly cooked through. Remove and set aside. Add remaining 1 tablespoon of the oil. Add the ginger and garlic, and stir-fry briefly. Add the mushrooms and stir-fry for several seconds. Then add bamboo shoots and water chestnuts. Stir-fry briefly. Give the sauce a quick re-stir, then make a well in the middle of the wok and add the sauce. Cook, stirring until the sauce is thickened. Return chicken to wok. Mix together and heat through. You can use chicken broth instead of chicken stock. Just bring it to a boil, add a bit of rice wine for flavor, and let it simmer for about 5 minutes. Another variation is to boil the mushrooms in the chicken broth before stir-frying.